Electroluminescent Wire (EL wire) is a relatively new technology that is not widely used in the theater. However, it is a versatile material that can be used for many lighting effects. This describes the technology and its advantages, explains the process of wiring EL wire, and a lighting installation using EL wire. 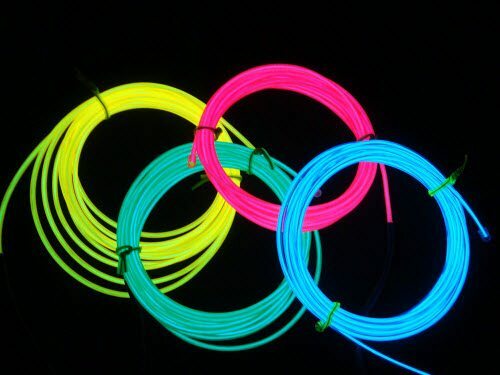 To make the EL wire glow, an AC voltage is applied between the inner and outer wires. Typically, a voltage of between 100 and 200 AC volts RMS is used, at a frequency in the low kilohertz. Conceivably, it could simply be wired directly to the standard 120V AC, 60Hz line power, but the brightness of the emitted light depends on the frequency of the power, so the wire will not glow brightly. Instead, an inverter converts DC power to a high-frequency AC output. These inverters simply take a two-wire DC input, and generate a two-wire AC output; they are inexpensive (about $10) and small enough that they can be concealed wherever necessary — including in a costume. The DC input power is typically 6 to 12 volts DC, and can come from either a battery or a common “wall-wart” DC power supply. Note that the AC voltage is applied between the inner and outer wires of the cable, not between the two ends of the wire — the power connection only needs to be applied at one end of the cable. The wire is available in a variety of thicknesses, from 1.2mm to 5mm. The smallest thicknesses are quite thin indeed, perhaps too thin to be very useful at theatrical distances except in certain special cases. Many colors are available; the phosphor emits a specific color, and the plastic outer coating is colored to further filter the output color. It is very flexible and can be easily shaped into the desired design. It is thin enough to install just about anywhere. It does not need much power, and the required inverter is very small. It is safe and does not run hot. Its principal disadvantage, however, is that its light output is limited. Certainly it cannot be used as a replacement for stage lighting; in fact, one needs to be careful that the stage lights do not over power the EL wire.Careful planning with the lighting designer is necessary. Cost is also a concern. Depending on the thickness of the wire, the price can range from about $1.50 to $2.50 per foot. Long runs can be expensive (though discounts for large lengths are usually available). In the theater, EL wire is suited for a number of special lighting effects. It can be used for decorating scenery — it is ideal for simulating neon signs (in fact, EL wire is sometimes referred to as “flexible neon”). Since the wire is so flexible and can be powered by a 9-volt battery and a small inverter, it can be hidden inside props or costumes that need to glow. This section illustrates the process of setting up an Electroluminescent wire installation using an installation. This installation had some nominal purpose, but mostly it was just a specious justification to bask in the intrinsic coolness of a wire that glows. There were two colors of EL wire used. The two strands of wire were connected together to form a 30′ wire. The inverter and battery were attached at one end of the long wire. A small project box enclosed the inverter and the connections, eliminating the exposed wiring, making it safer, more durable, and more aesthetically pleasing. Installing the wire was a fairly straightforward process — except that some parts of the wire wound up being harder to work with than I expected. The first step was to remove the plastic insulation around the wires. This was difficult to do without damaging the wires inside, especially the small outer wire.The most effective way I found seemed to be to (carefully) use a wire stripper to start cutting the insulation, then (even more carefully) finish removing it with a knife. I then scraped the phosphor coating off the inner wires, exposing the inner conductor. Once the insulation is removed, the wires become visible. This particular wire happens to be a double-core version, so it has two inner wires.This means that twice as much current flows through the two wires, each of which has its own phosphor coating, so twice as much light is produced. The outer wires are revealed to be tiny and nearly impossible to work with. They can’t be any larger than 30 gauge, and are quite possibly even smaller. My solution to this problem was to attach two short leads of 22-gauge solid-core wire to make the connection easier to work with. One lead was soldered to the outer wires, and one to both of the two inner wires. This connection was then sealed with hot glue, which served both to insulate the connections and helped hold them together. Even so, however, breakage of the tiny outer wires was still a problem. Next, an enclosure for the inverter and wiring was prepared. This was simply a ” × 2” × 4” project box. Two small holes were drilled in one side for the battery connection, and one larger hole was drilled on the other side to pass the EL wire through. The EL wire was then threaded through the large hole in the enclosure. It was necessary to do this before joining the two lengths of EL wire. The next step was to connect the two pieces of EL wire. This required stripping the two wires, and soldering their pairs of inner and outer wires together, respectively. The connection was then sealed with hot glue to insulate the two wires and physically hold the connection together. The far end of the second wire was taped over with electrical tape in order to prevent any hapless observer from touching it and being shocked. The leads on the first wire were soldered to the output leads of the inverter. Since the inverter’s output is an AC signal, the polarity of the leads does not matter. This didn’t stop one of my co-conspirators from zapping himself — but that was his own fault. The inverter and connections were installed into the enclosure, with the inverter’s input leads threaded through the small holes. The enclosure was then closed. With the EL wire and inverter setup prepared, all that remained was to shape and install the wire. 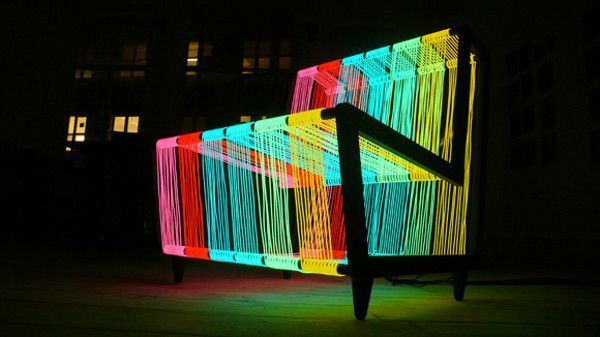 Since the EL wire was so flexible, it was easy to shape it. The wire was taped to a window, and the electronics attached nearby. Later, a timer circuit was attached to make the wire blink instead of glowing steadily.